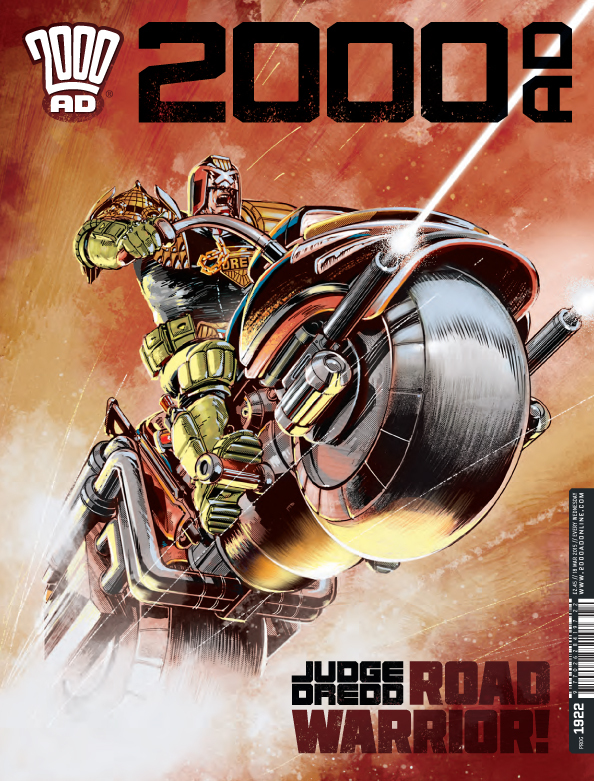 Not content with blowing us away with an amazing Mean Machine cover this week, Nick Percival gets to showcase his talents on another classic 2000AD character, the one and only Mr 10 Per Cent himself, Howard Quartz! As a man, Howard Quartz had, some would say, eccentric tastes, so when a robotic body ﻿became a priority, he made sure he went for that dashing, retro look. Why else would he have 70's style telephones on him, eh? Nick was thrilled to be offered the chance of painting this iconic character. He said "This was really just a bit of a laugh to do and a throwback to the 2000AD covers of the 70’s and early 80’s where they didn’t take themselves seriously at all! 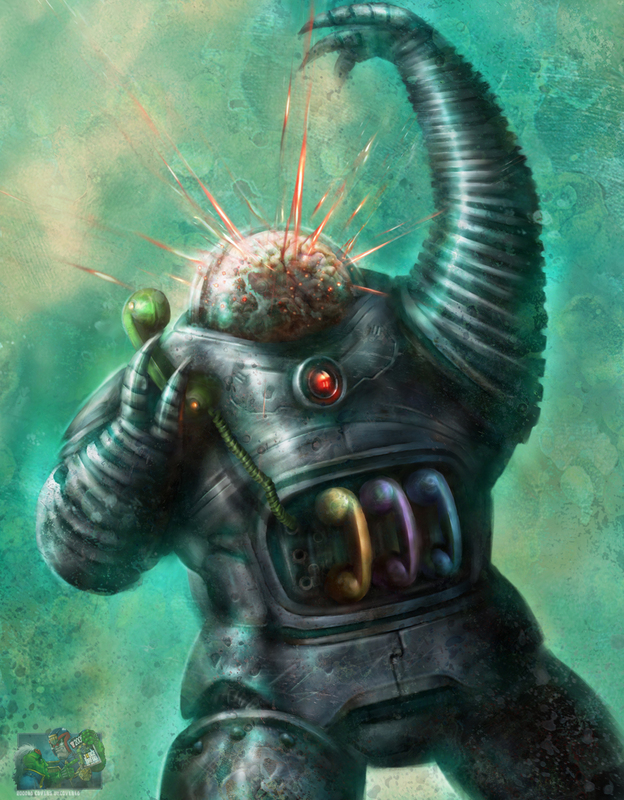 It was Tharg’s idea to have Quartz ‘shouting’ on the phone with the speech bubble to be added later..."
"The challenge was to make a robot with a brain in a dome appear angry and I wanted a slight cartoony, colourful feel, so it was a nice break from all the moody, serious stuff." Massive thanks to Nick for sending the images and text for a truly amusing cover, I love it! 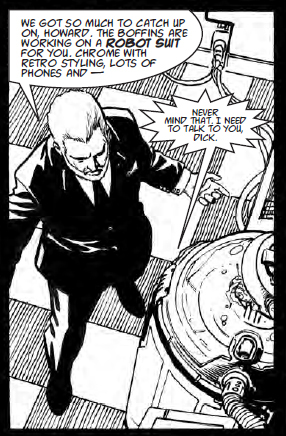 Also, thanks to Hawkmonger and Dark Jimbo of the 2000AD Forum for their help regarding the panel of Prog 1804 - thanks guys! Oh yeah! 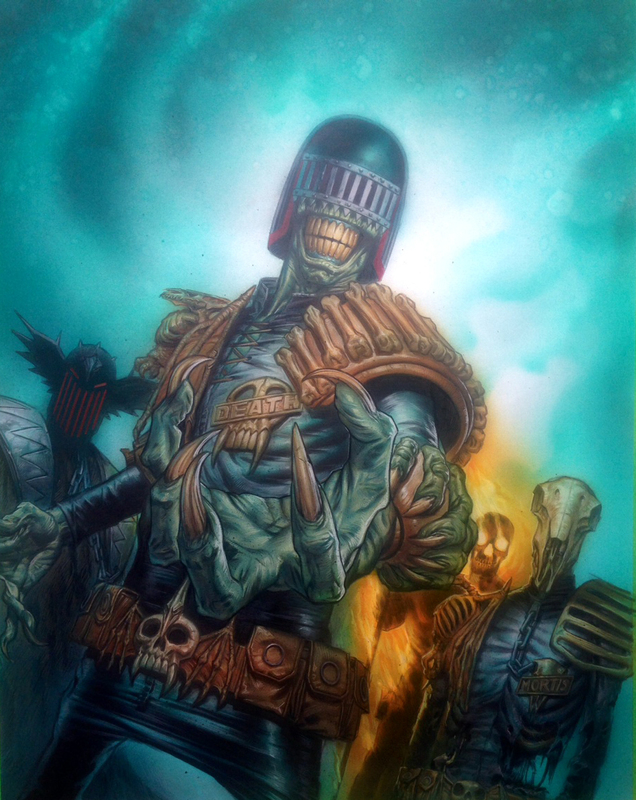 Jake Lynch blasts back with this absolutely awesome cover for Prog 1922. What a stunner! 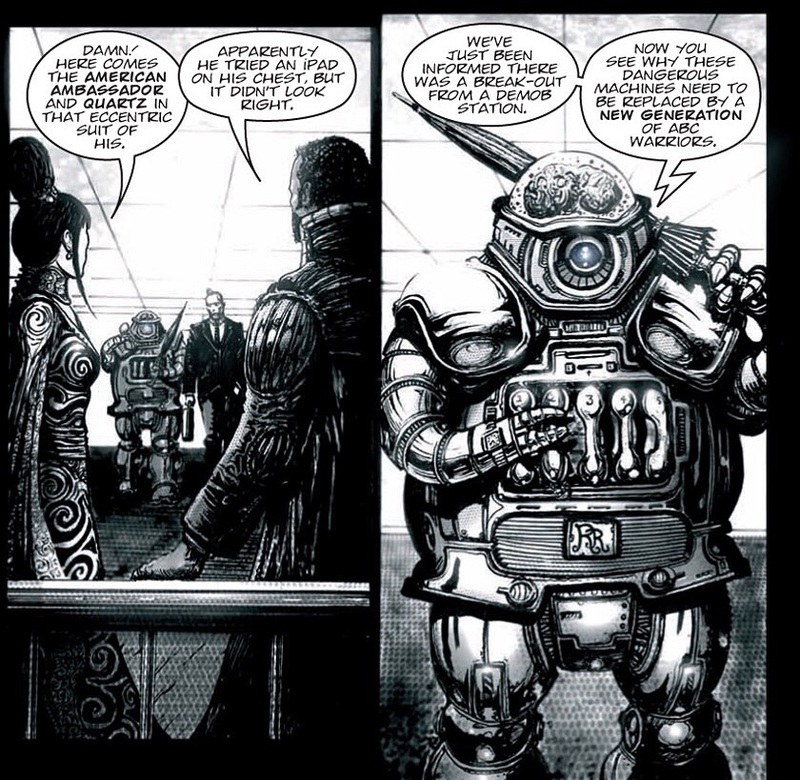 As Dave Piddlesworth, this blog's regular reader, may remember, that last time Jake was on the this blog (his Orlok cover of Prog 1917) things didn't end well. Jake earned a Rigellion Hotshot and a 'readjustment' session with Mek Quake after revealing a little too much of the Mighty One's practices. "Can you hear that noise? No..? Fine, then lets get on with this: This pic was a bit of an experiment to do something a little less painterly and a little more comic-book...er..ee. 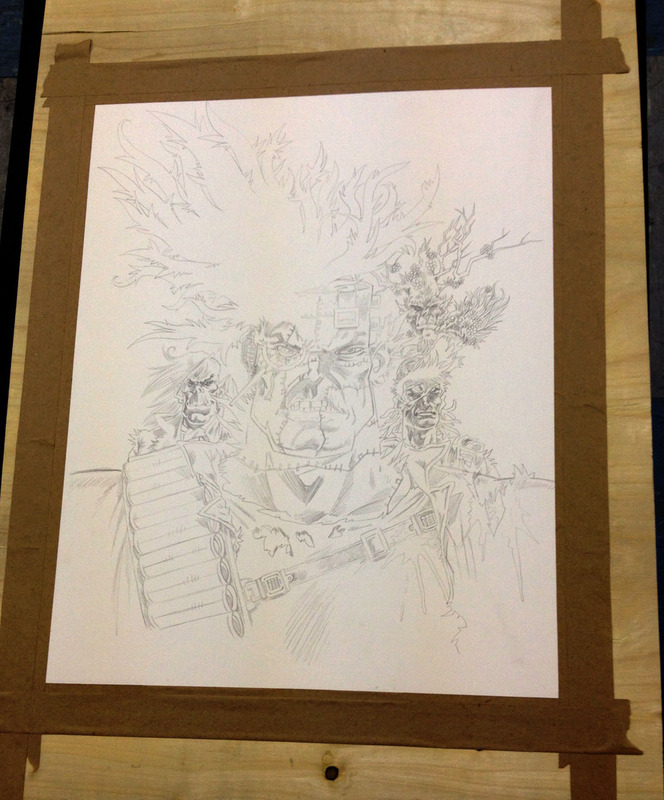 Still smarting from my last encounter with the Mighty One (his long range accuracy is staggering,) I begin..."
"The original rough is quite fun but, as I'm inking it, I start feeling that this Dredd is not worthy of a cover (possibly more suited to Notre Dame!)..." 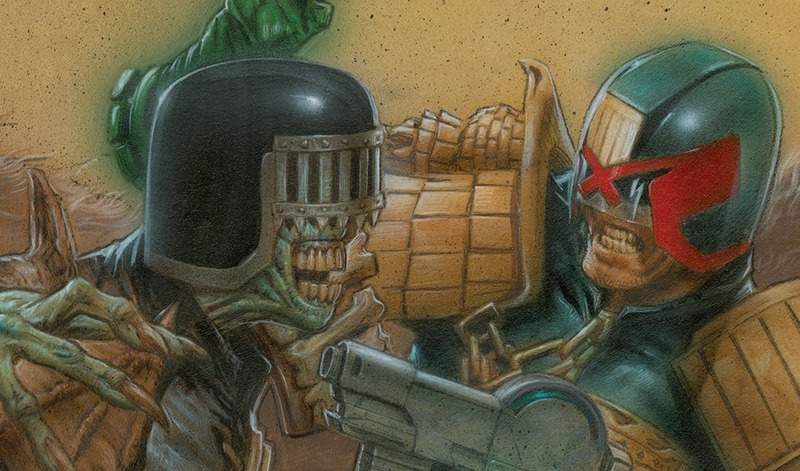 "Wind yer neck in Dredd!" A nervous looking Jake continues "I also have a really bad habit of doing awful knee pads, so I redraw..."
"I get hold of a piece of glass using my awesome scrounging skills, on which I paint some random strokes using an Acrylic modelling paste to help keep the texture in the marks. 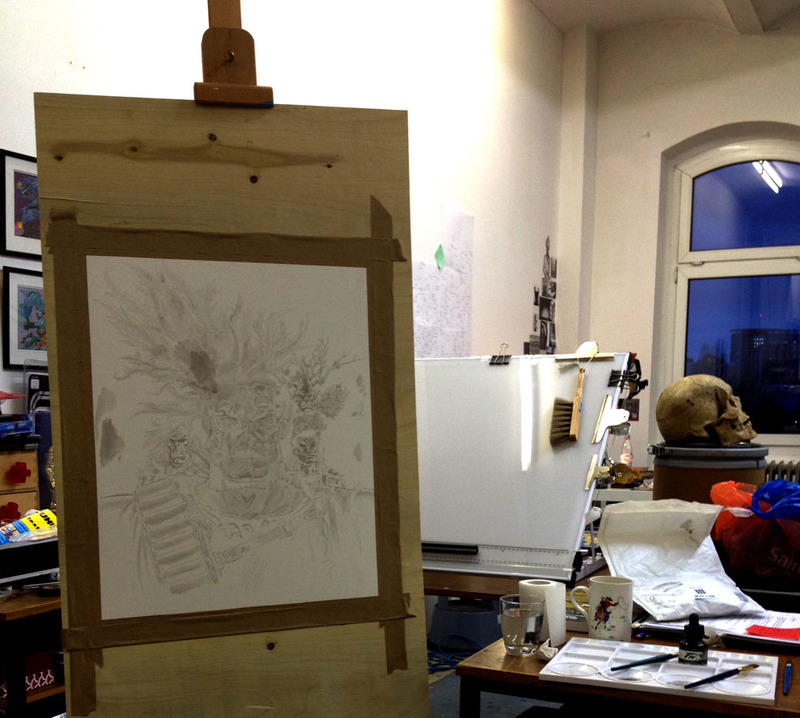 I then take a photo of it and use it as a starting point for the background." Bloody hell! Last week Greg Staples painted on wood, this week Jake on glass. Is there a paper shortage at the Nerve Centre? "This sheet of glass is proudly sponsored by Antique and Period Glassworks, Norfolk - thanks, Keith! There's that noise again... No? Okay." "While Tharg laughed, Pye01 stole my tot of oil so I take revenge by destroying his logo! 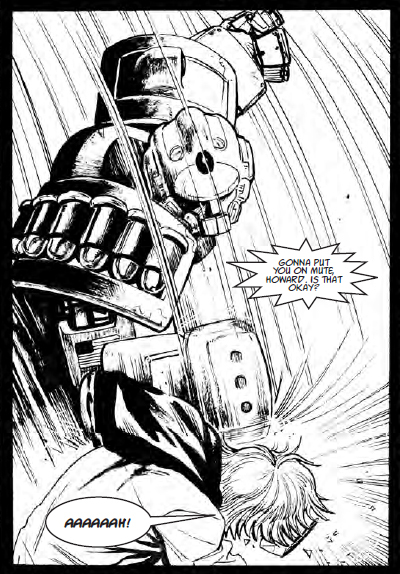 This made the droid rage, forcing Tharg to smite us both mightily with high velocity hotshots...repeatedly." Just another day at the Nerve Centre then? I take it Dredd doesn't like the new logo? "Colour, colour, colour and done?" "5... 4... 3... 2... 1... We have lift off!" "Before Tharg would accept the finished pic he decreed the chain be redrawn so it could be seen more clearly (and there would be consequences...)"
"This final touch done it was sent off and everything went perfectly with no repercussions whatsoever :-)"
"Okay, enough is enough, which one of you jokers is making that whistling sound!? I knew I heard something! Come on, own up. It's only your own time you're wast- AAAAAARRRRGGGGHHHHhhhh...!!" This cover was produced by Michael Bay. Massive, massive thanks to Jake (Grud rest his soul) for sending the images. Wait... could it be? Yes! There's a faint electronic pulse, so hopefully we'll see him back on the Prog soon. Now, where did I put that number for Droidline...? 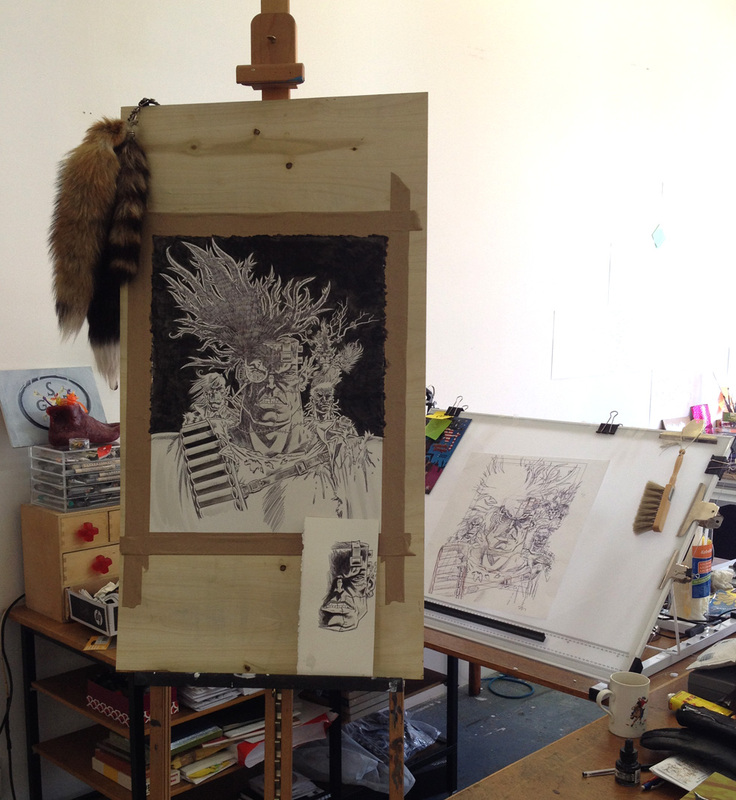 Rufus Dayglo - Keeping Good Company. 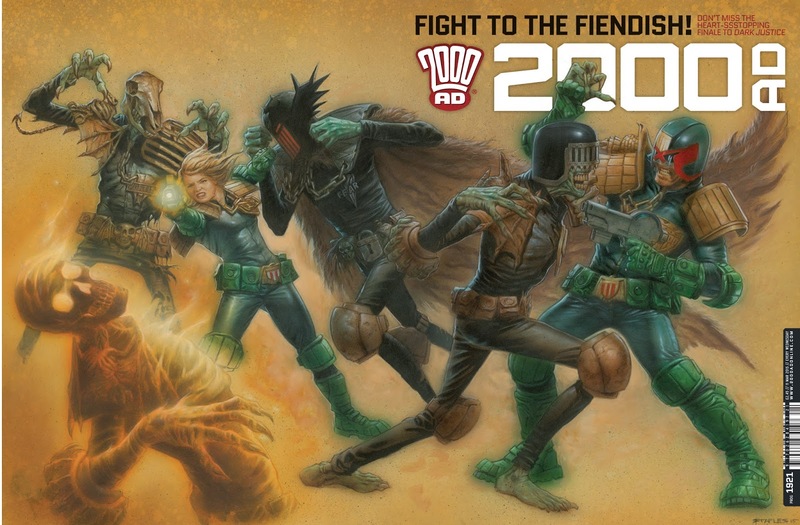 This week the news finally broke that Bad Company is making a welcome return to the hallowed pages of 2000AD. 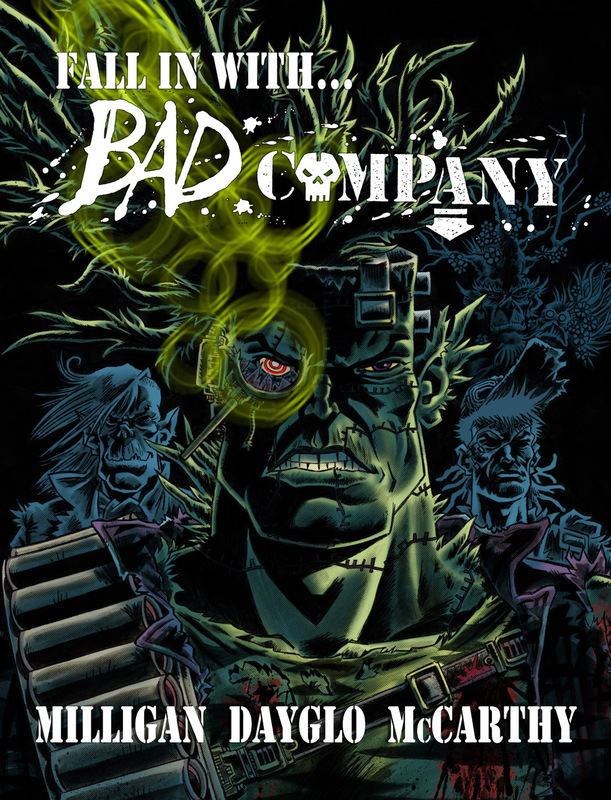 'Bad Company - First Casualties' will be written by series creator Peter Milligan asked inked by original inker Brendan McCarthy. 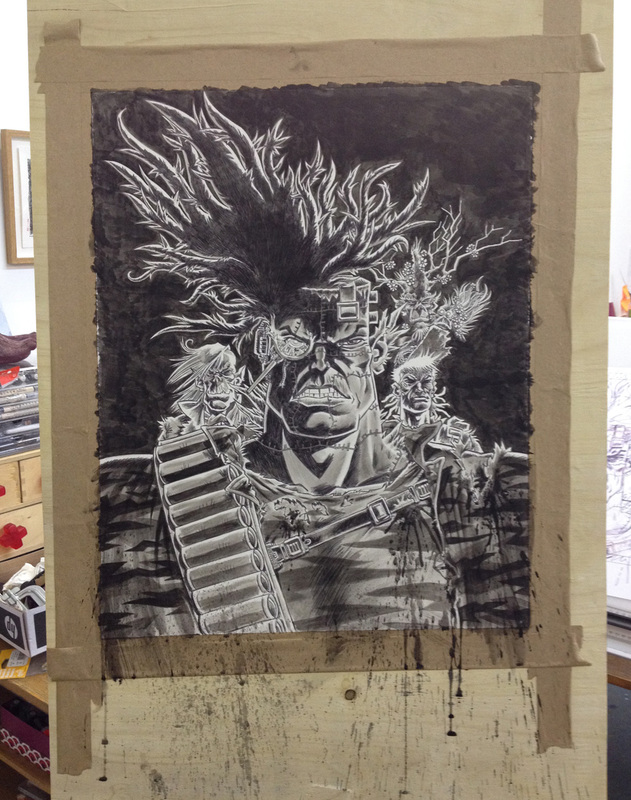 The strip will be penciled by the fantastic Rufus Dayglo, which surely means that First Casualties will be a fitting tribute to the late, great Brett Ewins who sadly died last month. Rufus, a good friend of Brett, is delighted to be pencilling the strip, and got in touch to show his working methods behind a recently released promo image. Over to Ruf! 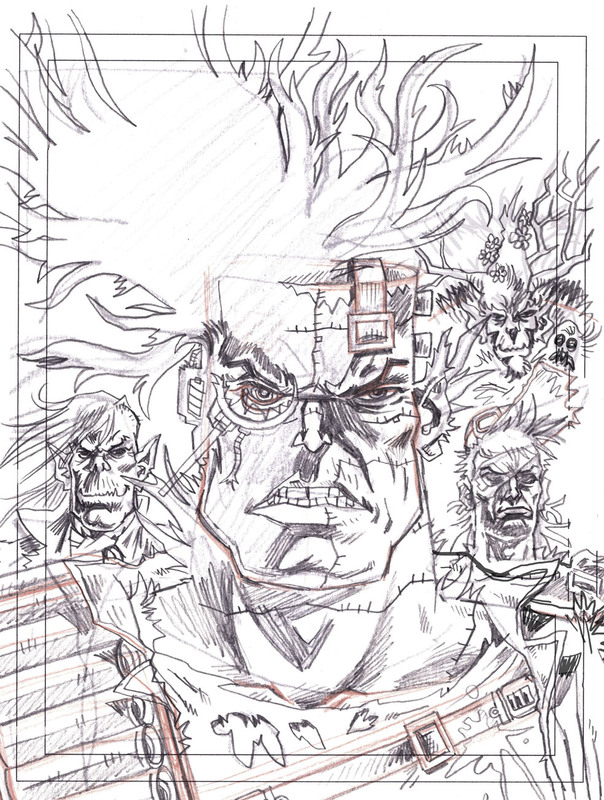 "I've been asked by a few people who I created the Promo art for the new BAD COMPANY - First Casualties series, so thought I'd put up a few pictures showing my err... 'process'...."
"I started off with a little thumbnail, about 1 1/2 inches high..."
Aw... an itty bitty Kano, how erm... cute? 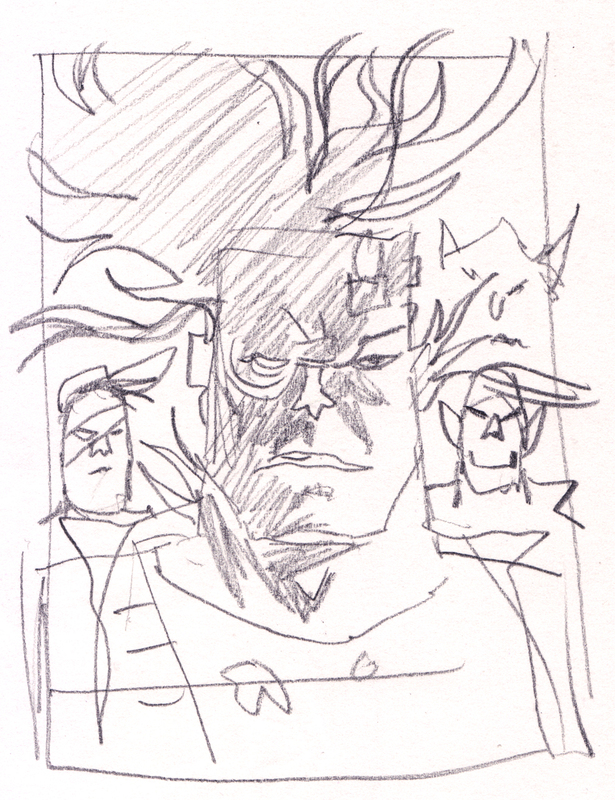 "Then I pencilled out a proper rough, and scanned it, and printed it out larger. I pencilled it onto water colour paper (Arches hot press 300gsm, it's actually cotton fibre, not paper, so a lovely surface to draw on)..."
More like Afro than Kano! 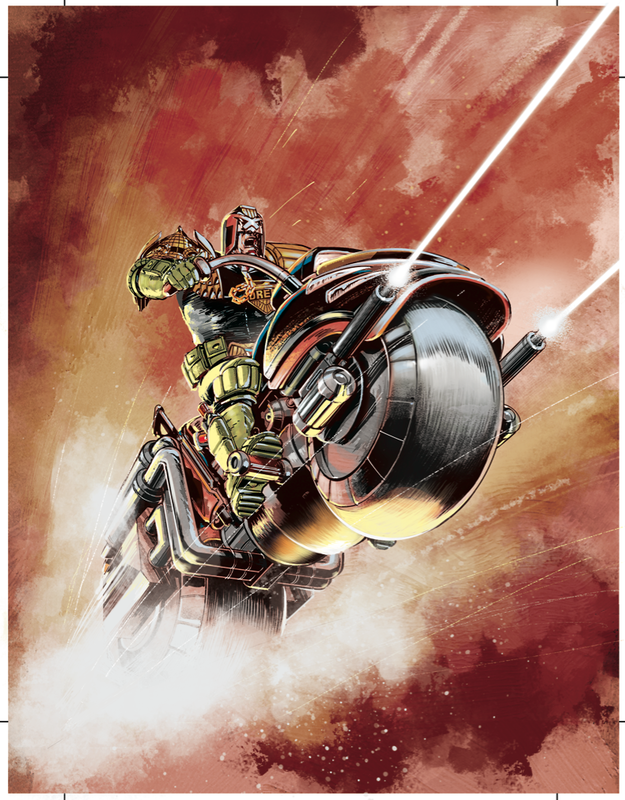 "Then I wetted it down to a board..."
Check out the McMahon Dredd Trading Cards art, just being the board! "And painted in the background black...."
So, a human skull in the previous pic, and a severed foot here? Nothing to worry about at all! 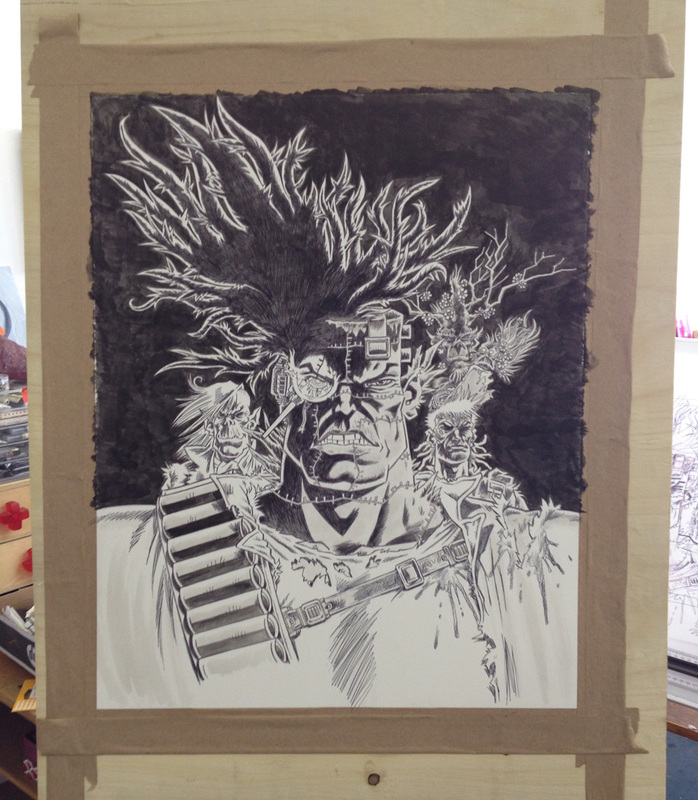 "At this point, I changed my mind on my approach ( I had intended to 'ink' it last...) and decided to add inked lines... I opted for ballpoint pen haha, as I love them, and they are waterproof when dry, so great to paint over. Spot the Solid Gold Death Mask refs! 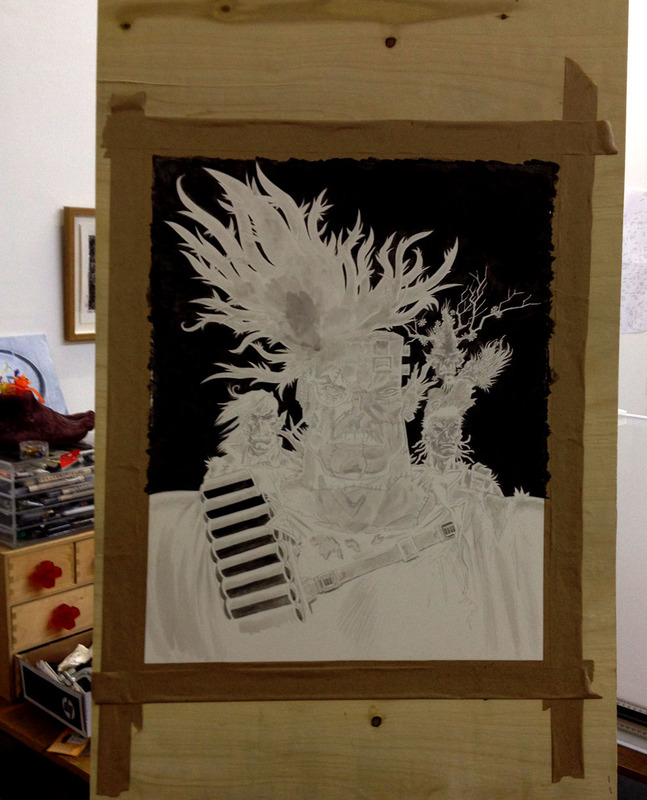 "Then I cut it off the board, and scanned it at 600dpi (colour) and patched the scans together in Photoshop as it was large art." 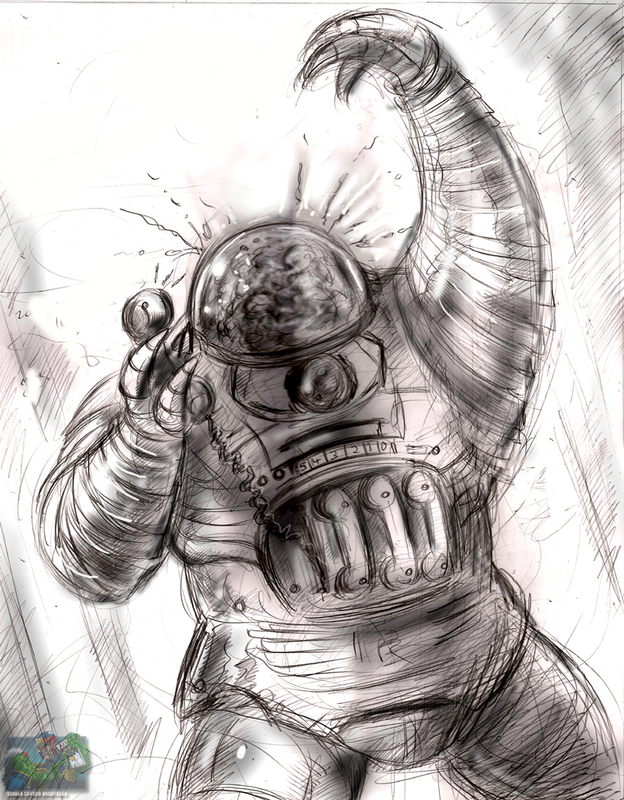 "Then I added colour, and a few effects around his eye, then finally some type... and Presto!" "Hope that made some sort of sense! The most important thing to remember is to have fun drawing, try not to panic (as much as me...mumble mumble ) and drink loads of coffee, and have a good supply of Kit Kats! Thanks to Rufus for sending this fine article out of the blue, I'm honoured! 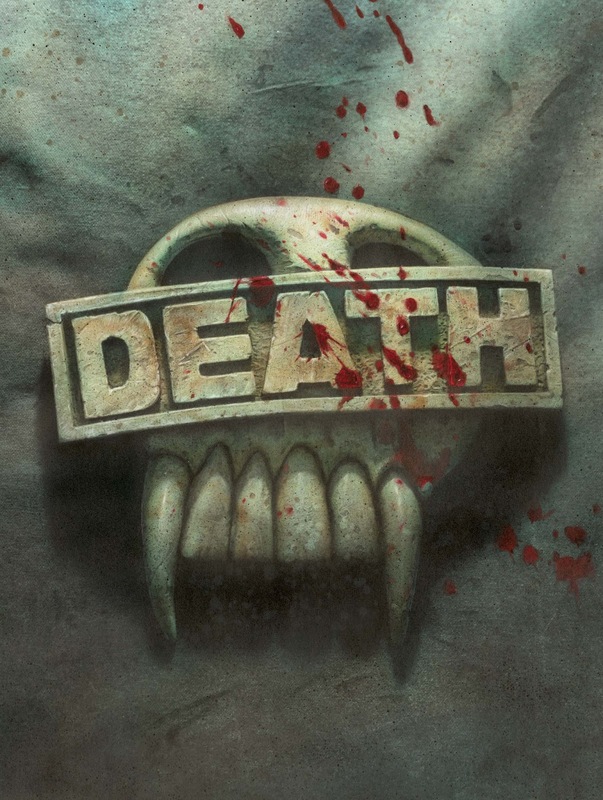 Greg Staples - Danse Macabre. The series has looked absolutely beautiful, two years in the making and worth every second! When this is collected into a beautiful hardback graphic novel I'll be first in the queue! It's no use trying to hide Sidney, that's tracing paper! Sssshithouse that he is though, Death manages to swat away the piece of paper, aaaaaagh! And we pan out to see just why he's so happy - about to off poor Joe again eh? Do you know how long it takes Death to manicure the nails on his elbow pad? Ssssstlye is everything! Greg adds some evil ink that has been cursed by Putin himself - the horror! "Jussst one little kiss Joe!" I bet you're thinking this is the real Fire eh? It's simple really - Boing(R) for the other three, camomile lotion for Fire. Fooled you, it's Mortis' skeleton string puppet! Curssse that spoilsport Anderson though, shooting the strings. Throw your hands in the air, and wave 'em like you just don't care! But how can we stay made at her when she's such a cutie eh? Sadly, Greg dropped his bag of chips over the piece and got grease all over it - noooo! See? They ARE dark judges! Oooh, Fire's looking a bit pale, I hope he's okay. Ssssso? Megcleans removes plaque, synthicaf stains aaaand gives you fresh breath? I musssst try it!" 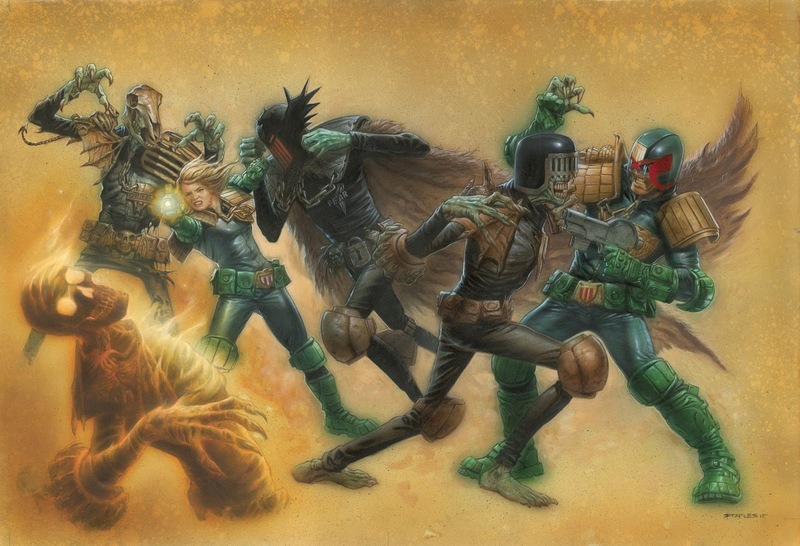 Dredd, our hero, takes one of them on, while Anderson deals with THREE. And here's how it looks on your Prog, a masterpiece! Too much synthiketchup on his hottie again. "Come with me, if you want to erm... die!" Huge thanks to Greg for sending the images and a hearty congratulations on completing this epic story. 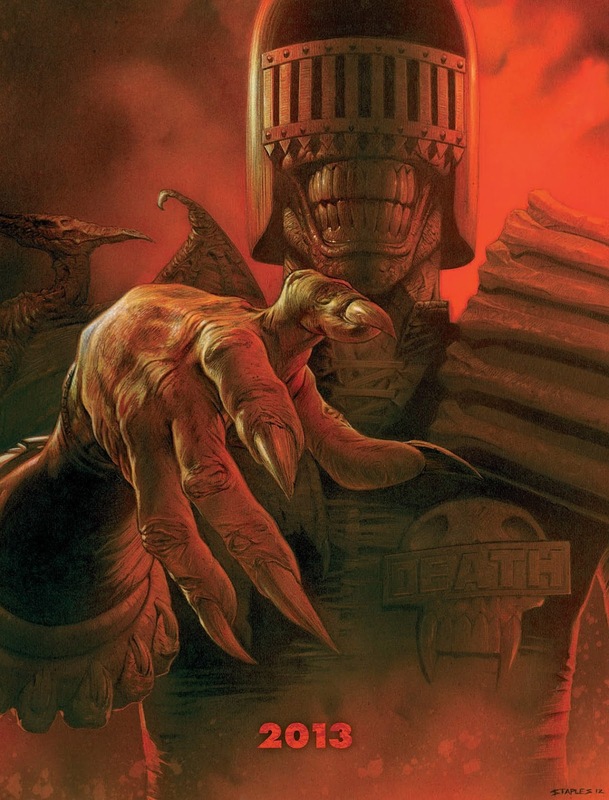 It will forever be know as on of the, if not the, most beautifully painted Dredd story ever! 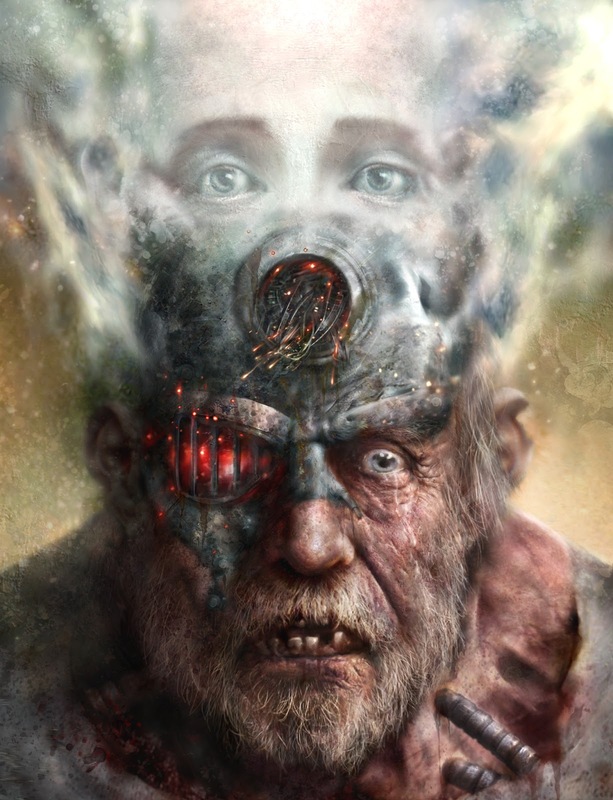 If you are the LSCC this year, be sure to check out the painting in the rotten, decayed flesh from 2pm at booth B12, where Greg will be signing! 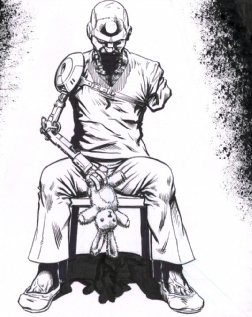 Dylan Teague - Viley Cyborg. John Higgins - Many Zarjaz Returns!